Who is the Needham Exchange Club? As a member of America's National Service Organization, the Needham Exchange Club has been serving Needham since 1947. All proceeds from our fund raisers go directly back into the Town of Needham by way of our many projects and events that reach out to every member of our community. 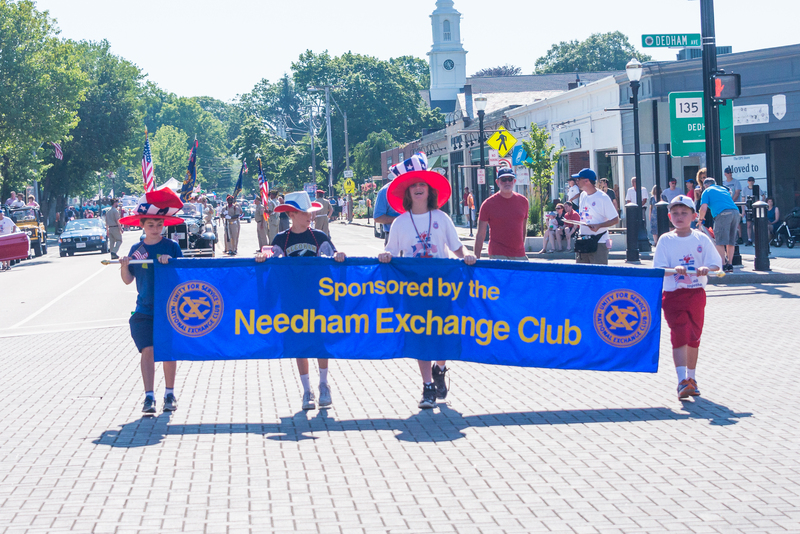 The Needham Exchange Club will once again be sponsoring the annual 4th of July celebrations for the Town of Needham. Current updates on this year's event, including information on registering a Community Float, can be found at this location. 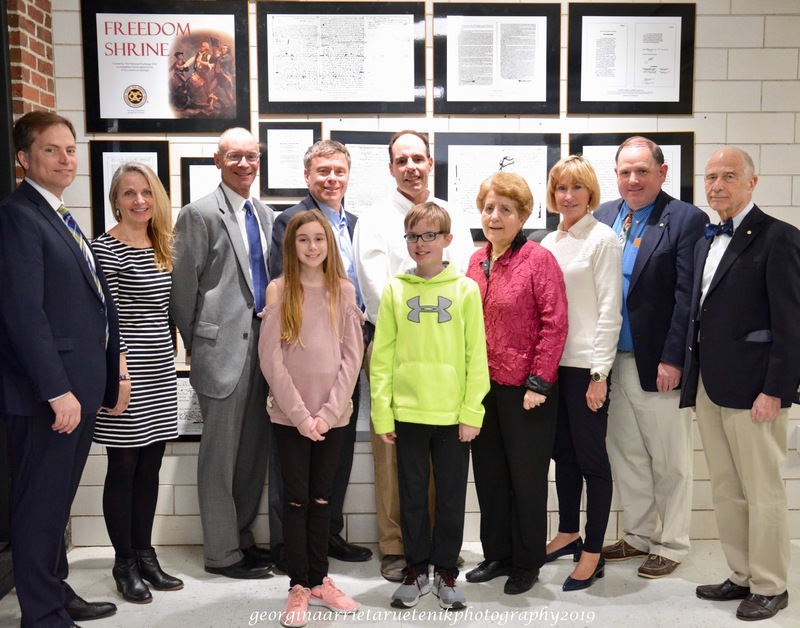 The Needham Exchange Club is pleased to announce the recent dedication of a Freedom Shrine at the Mitchell School. The Freedom Shrine is a collection of original historic American documents photographically reproduced and displayed in thousands of locations throughout the country. The Needham Exchange Club donated this Freedom Shrine to the Mitchell School, and speaking at the dedication were Needham Exchange Club President Michael Taggart, Select Board member and past president of the Exchange Club Moe Handel, Mitchell School principal Greg Bayse, and Needham School Superintendent Dr. Dan Gutekanst. In attendance also were Exchange Club members Ann Cosgrove, Chris Kent and Cynthia Chaston, as well as several students from the Mitchell School. Developed by the National Exchange Club, the Freedom Shrine originated from the Freedom Train that toured the nation in 1947 carrying an exhibit of historic documents. The National Exchange Club Freedom Shrine includes nineteen of the original documents from Freedom Train exhibit, such as the Declaration of Independence, the Constitution, the Bill of Rights, the Gettysburg Address and the Nineteenth Amendment, just to name a few. The Mayflower Compact and Martin Luther King, Jr.’s “I Have a Dream Speech” have additionally been included in the Mitchell School Freedom Shrine, at the request of the school principal and teachers. The Mitchell School plans to use the Freedom Shrine in its school curriculum. The Needham Exchange Club is pleased to announce that Dave DiCicco is our 2019 Book of Golden Deeds Award Winner! The Book of Golden Deeds is given to honor a Needham resident who has a demonstrated history of selfless contribution/dedication to the Needham community. Dave is a long time resident of Needham, having moved here from Brighton with his wife and young family many years ago. He owned and operated Newton Street Garage in Brighton for many years. Dave organized the Brighton Golf Tournament raising money for cancer research from 2002 to 20007 and has been a member of the Knights of Columbus for many years. Dave coached Little League baseball through Babe Ruth including summer travel teams, coached girls’ softball, coached St. Joe’s basketball and coached Pop Warner football. He served as President of the Pop Warner board, served as President of the Touch Down Club and served as treasurer of the Touch Down Club. He helped to negotiate the switch for the Needham football program from Pop Warner to the American Youth Football League in 2005 to better serve the Needham kids and the metro west kids. As a member of the Touch Down Club Dave helped to generate funds to offset cutbacks in the school budget to purchase much needed uniforms and training equipment for the football and cheerleading programs. Dave co-chaired the “Wall that Heals” committee, the group that coordinated the visit of a half scale Vietnam Memorial Wall to Memorial Park in 2008. Dave served on the Needham Field Study Committee from 2003 to 2008 and served as a Trustee of Memorial Park from 2005 to 2009. He helped create the Needham Sports Council, the group responsible for privately funding approximately $5.5 million of the $7 million needed to renovate the fields at DeFazio and Memorial Parks. This “Field of Dreams” project renovated our playing fields, including the installation of artificial turf and lights. Dave currently serves on the Park & Recreation Commission and was instrumental in the approval and construction of the Rosemary Recreation Complex. He advocated for a spray deck, a slide, a recreation room, a dock and sailboats for that facility. In 2018 Dave, along with Exchange Club member Matt Borrelli, created the Needham Flag Football program. Last year they had 370 youth participants, both girls and boys, play in their inaugural season and this year the program will be even larger. This program was created for kids to learn about playing football and to have fun, regardless of abilities. The Needham Exchange Club congratulates Dave on this award and thanks him for his service to our community! The Needham Exchange Club meets on the first and the third Thursday of the month, September through June. Meetings include socializing, dinner and a speaker on a topic of general interest. Membership in the Needham Exchange Club is open to anyone with an interest both in Needham and community service.